Raccoons, while cute and seemingly cuddly, are incredibly dangerous to have in your home. According to the Humane Society of the United States, these creatures carry and spread rabies, roundworm, leptospirosis, and other potentially serious diseases. These critters can be found all throughout North Carolina, in both urban and rural environments. Raccoons are characterized by mischievous behavior, their bandit-looking faces, fuzzy grayish-brown fur coats, fluffy black-ringed tails, and bulbous bodies. Not only are they highly intelligent creatures, but they are also quite resourceful and adaptable. They can weigh between four and 23 pounds. Raccoons are omnivores, meaning they eat foods of both plant and animal origin; in other words, they eat whatever they can get their claw-toed paws on. Most raccoons have a lifespan of two to three years and spend a lot of their lives living in small families. 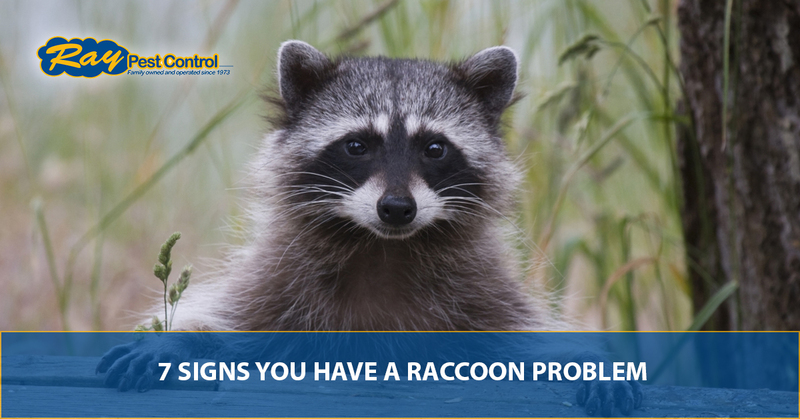 If you think you have raccoons in your home, you will want to have a professional wildlife control team safely remove them from your property, rather than attempting to do so on your own. Read these seven warning signs and if any of them sound familiar, contact Ray Pest Control, Piedmont’s Top Rated Local® wildlife removal experts, immediately. If you hear unusual scratching sounds and thumping coming from your attic at night, there’s a good chance raccoons are to blame for the noise. Raccoons are nocturnal, meaning they are more active at night. Hearing these sounds could be raccoons rummaging for nesting materials or coming and going to find food. Additionally, raccoons are vocal creatures, so if you hear high-pitched crying sounds, these could be coming from a litter of baby raccoons, also known as kits. Raccoons begin building nests the minute they move into a den, which might just be your attic, garage, basement, or a hollowed-out tree in your yard. Raccoons like cozy, comfortable nests, so they often build nests using a variety of organic materials, clothing, newspaper, cloths, and other materials. If you notice these materials strewn about in your home or yard, you might just have a family of raccoons living with you. Raccoon droppings are pretty easy to recognize. Their feces are tubular in shape and dark in color. You might notice twigs, berries, and other undigested foods in raccoon poo. They often defecate near trash cans, in yards, in gardens, and even in the nests they’ve built inside your home. One of the most obvious ways to identify a raccoon problem is when you see their small, clawed footprints around your trash cans, recycling bins, garden, and garage. You may even notice claw marks from scratching on your trash cans, flower pots, planters, birdbaths, and other outdoor items. Do you constantly come outside only to find your trash cans have been tipped over and there’s trash strewn about everywhere? If so, either raccoons or some other nuisance animal have marked your home on their radar as a food source. While tipped-over trash cans don’t mean raccoons have moved into your home, it’s a sure sign of a problem that could get worse if it goes unaddressed. When you actually see multiple pairs of reflective eyes staring back at you from your yard, trash can area, garage, or worse — your attic — these eyes probably belong to raccoons. People typically find raccoons walking in a line across their yards, near gutters along the streets, in trash cans and dumpsters, climbing up trees, or poking around the garden or composter. Seeing them on your property once in a while is one thing, but if you see them frequently, it’s time to have the wildlife removal pros come out and take a look at your home and property. If you notice any of these signs, you most likely have raccoons in your home. There’s no need to fear, however, when you have the professional wildlife removal experts at Ray Pest Control on your side. Along with providing residents and businesses in the area with Top Rated Local® pest removal, our pest control company specializes in wildlife removal. We can take care of your raccoon problem safely, with the proper equipment and experience required to handle these critters. Don’t try risky, ineffective DIY raccoon removals when we’re just a call or click away. Coexisting with raccoons is possible, but not when they move into your home. Call us today to get rid of your raccoon problem for good! Have other nuisance animals and wildlife creeping around your property or setting up residence in your home? Our wildlife control company handles everything from groundhogs, opossums, and squirrels to bats, moles, beaver, and more. Coexisting with critters is one thing, but don’t let them take over your home. Call us today to get a free quote and visit Ray Pest Control to view our specials.